There are many easy ways for individuals and businesses to reduce their paper use and costs. Reductions of 20% or more are possible in most offices. Potential savings are up to 10 times the purchasing costs of paper, through reducing the cost of storage, toner, printing, labour, postage and disposal. Here are practical tips to help you at home or at the office to implement a cost-saving, paper reduction programme. Again just follow the golden rule and ask yourself whether you really need to the print. Collect the paper you use and then reuse where possible (print again on the other side if you printed on one side only or use it for note paper). And when you do have to buy new paper make sure it is recycled. Reductions of 20% or more are possible in most offices. So ask your office manager what they are doing to reduce paper. Remind them that saving paper isn’t just about protecting the environment; it can also save them a lot of money! 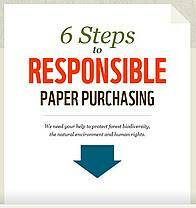 WWF has a guide for how businesses can reduce their paper consumption to make it even easier.